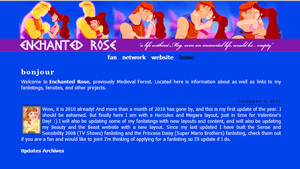 Screencaptures of the previous layouts of Enchanted Rose/Medieval Forest. 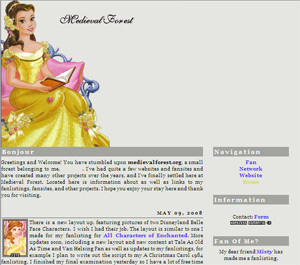 Features Belle in a clipart from Disney Clipart Galore as well as the fonts Felix Tiling and LainieDaySH. I made this dark forest layout on the suggestion of my boyfriend, and for Halloween. 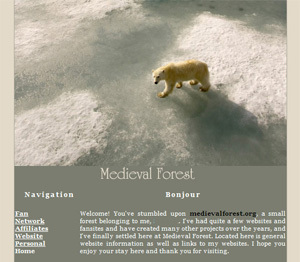 Features a forest picture I found in a yahoo! search from flickr and the fonts Black Chancery, which can be found over at DaFont.com, as well as Lucida Sans Unicode, Georgia, and Times New Roman. Brushes are from Moargh.De. 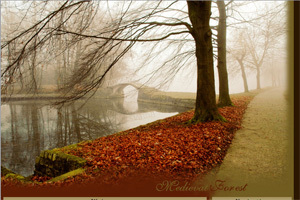 I found this picture while browsing through some Fall images and I loved it! I thought it was perfect for fall/winter, since it looks like autumn but also chilly and a bit cloudy. 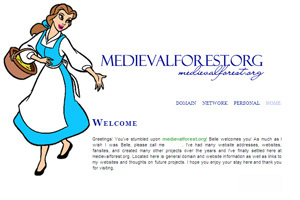 The font used in the layout is SarahVolanteDB and as text the fonts used are Trebuchet MS and Georgia. I wanted to make a Christmas layout with pictures of Disney Face Characters, and I knew I had seen Belle with a coat in some pictures, and luckily I found several pictures of Belle and Aurora together with coats. Pictures used are from Disneyland Cast Member Magic. The font used in the layout is LainieDaySH and as text font is Georgia. 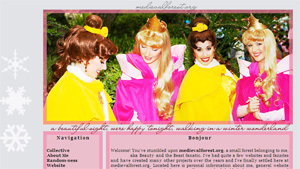 Pictures used in this layout are from the Disney Princess A Christmas of Enchantment. 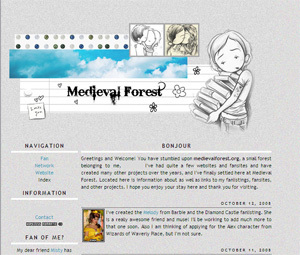 The font used in the layout is Monotype Corsiva and as text font is Georgia. I love this animated backgroudn and it gave me a really nice feeling of snow and Christmas. The picture used in this layout is from National Geographic. The font used in the layout is Occidental and as text font is Georgia. 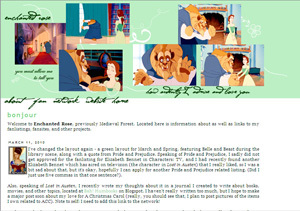 The pictures used in this layout are a blend of screencaptures of the Enchanted trailer. 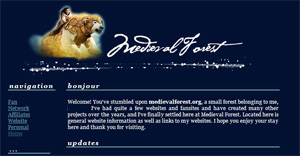 The font used in the layout is Porcelain and as text font is Trebuchet MS. The pictures used in this layout are from posters and wallpapers of The Golden Compass Movie. 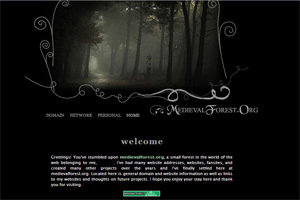 The font used in the layout is HannibalLecter and as text font is Georgia. I made this layout because of my boyfriend. I asked him which movie or animated character I reminded him of the most, and after thinking he answered Giselle. I thought that was really sweet so I made this layout. 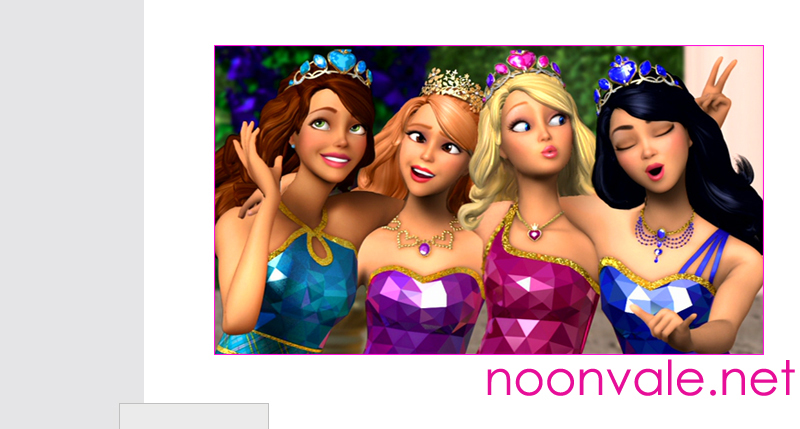 The pictures used in this layout are from pictures of Walt Disney's Enchanted Movie. The font used in the layout is Chubby Cheeks and as text font is Georgia. Patterns are from 77 Words and brushes from Moargh.de. Layout 10 - One of my favorite layouts EVER. 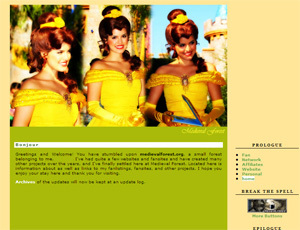 I wanted to make a layout featuring Belle from Disneyland, and used pictures from Disney Cast Magic. The font used is called Vivaldi. 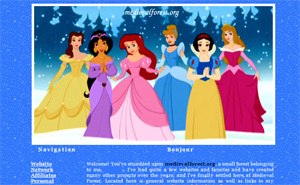 A layout featuring a clipart of Belle with a book. I wanted to make a layout like this for some time. The font used is Vivaldi. 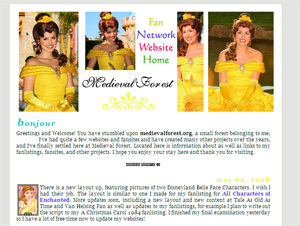 I still want to make a layout featuring pictures of Belle from Disneyland, and used pictures from Disney Cast Magic. The font used is called Lucida Handwriting. 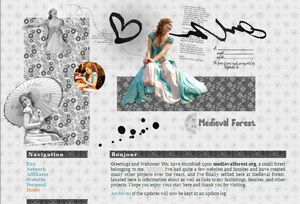 A layout featuring Giselle from Enchanted. The font used is called Lucida Handwriting. 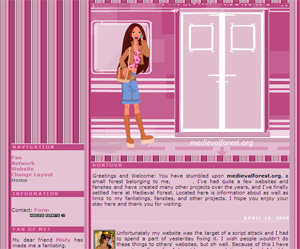 A layout featuring Nolee from MyScene. The font used is called Lucida Handwriting. 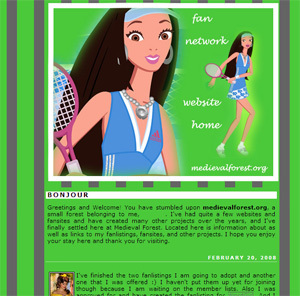 A layout featuring a picture from MyScene. The font used is called Maiandra GD. 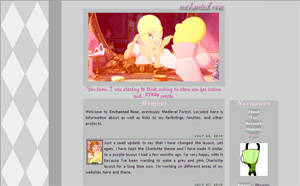 This was previously the last layout for my Albus Dumbledore website before I closed it, but I thought it was so cute that I decided to keep it on my main website, first as a skin and then as the main layout. The artwork is from Potterpuffs and the font used is called Lumos. A Beauty and the Beast layout made with the help of this tutorial and textures from Sanami276 as well as brushes by Moargh. The fonts used are Love, Hannibal Lecter, and Georgia. And I continue my goal to make a layout with pictures of Disneyland Face Characters, these pictures are from Disney Cast Magic. The fonts used are SarahVolanteDB, Calligraph421 BT, and Georgia. 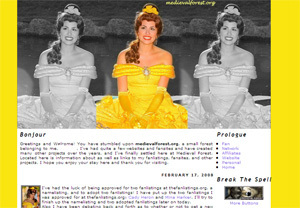 A layout featuring a beautiful picture of Belle reading from Disney Enchanted. The font is Sarah Volante DB. A layout featuring Chelsea from MyScene. The font is Love Letters. A layout featuring Anastasia from Cinderella, who after Cinderella III: A Twist In Time, is now one of my favorite animated characters. The font is Bleeding Cowboys. A layout with a love and back to school theme, partly for my anniversary in September ♥. The font is Bleeding Cowboys. 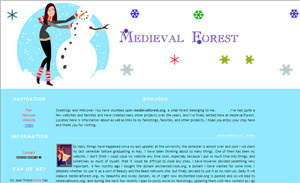 A layout featuring a girl and a snowman, for the winter/Christmas holiday. The font is Christmas. Layout 25 - I was so happy with the way this layout came out. 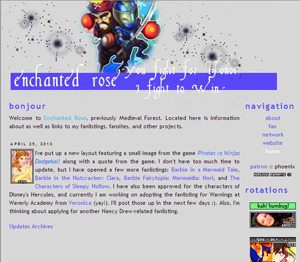 I was going for a diamond background theme across horizontally, but ended up changing it to this layout. 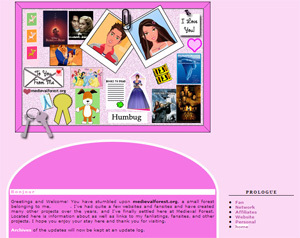 Layout 26 - A Hercules and Megara layout in time for Valentine's Day 2010. 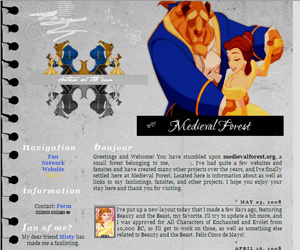 Layout 27 - A spring themed layout featuring Beauty and the Beast and Pride and a Pride and Prejudice quote. 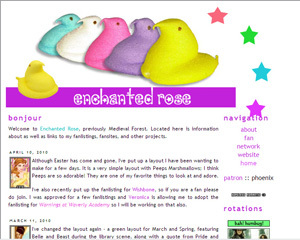 Layout 28 - A layout for Easter featuring Peeps, one of my favorite things. Layout 29 - A layout featuring Pirates vs Ninjas Dodgeball. I love Pirates, Ninjas, Vampires, etc, but especially Pirates. 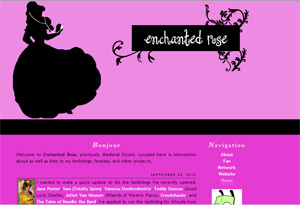 Layout 30 - A pink and grey layout featuring Charlotte from The Princess and the Frog. I had been wanting to make a Charlotte layout since the movie was released. She is my favorite character on there. 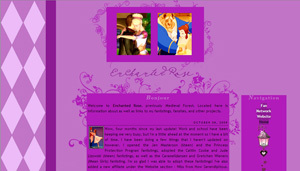 Layout 31 - A grey layout featuring Charlotte from The Princess and the Frog, in the style of Layout 25. 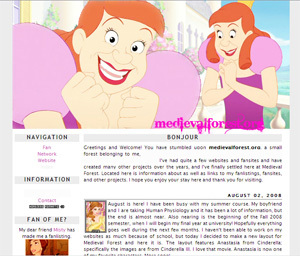 Layout 32 - A pink layout featuring an image of Belle with an iPod. I had been looking for an image of iBelle for a while but didn't find what I was looking for, so I made this one. The font is Dollhouse. I am really happy with how fun it came out.